30 days from today we we will be boarding a Disney cruise ship and sailing off into the caribbean for a week. We cannot wait. It is definitely time to kick packing and preparation into high gear, especially since I will be out of town the whole week before we go. I have an October 4th deadline for myself for getting us all packed. And if it would ever get cool and fall-like outside, I could wash and pack our shorts/summer clothes...but alas it is a high of 88 today. 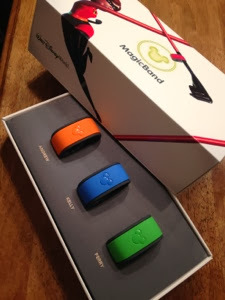 We got our documents last week and have been anxiously awaiting the arrival of our MagicBands. We are going to stay at Walt Disney World a couple days before the cruise and just happened to pick resorts well and picked one that was participating in the early testing of the MagicBands. MagicBands are essentially the new "key card" for Disney World. They get you in your hotel room, work like a credit card, get your fast passes, and are your tickets to the park...all with a swipe of the wrist. Sounds awesomely simple. And slightly creepy...but mostly awesome. The bands finally came today. 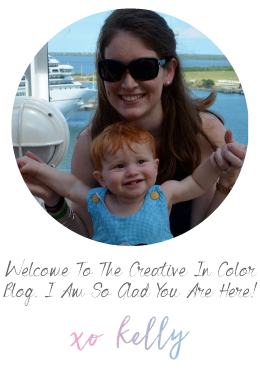 We were able to go online a couple weeks ago and pick our colors. Our names are even printed on them. Even Perry has a MagicBand. They say one size fits all...but I am not sure they meant 9 months in their "all." Thanks Disney! We can't wait to come visit next month and try them out.